Meeting the needs of the Community and attracting new convention business to Lethbridge, AB. Community engagement and Letters of Support for the project. Lethbridge, Alberta – Exhibition Park in Lethbridge announced today that a major strategic partnership agreement has been signed with the Lethbridge Lodging Association (LLA/visitlethbrdge.com). This strategic partnership will develop the base for promoting Exhibition Park as a major meeting and conference facility in Southern Alberta, the LLA Member hotel properties and Lethbridge as a destination. LLA is an association of Lethbridge accommodation properties working together to increase overnight stays for member properties. It strengthens the Lethbridge economy by partnering with and collaborating closely with organizations to create new and sustainable tourism opportunities in Lethbridge. The association’s website – VisitLethbridge.com allows visitors to: purchase their rooms online, see a list of activities and events to attend, and get information about Lethbridge as a destination. The website provides easy online booking and promotes Lethbridge as the ideal destination for corporate and leisure travel with entertainment and tourism options for all ages. 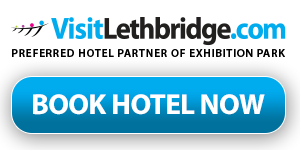 Lethbridge Lodging Association Hotel Members are Holiday Inn, Holiday Inn Express, Best Western Plus Inn and Suites, Coast Lethbridge Hotel and Conference Center, University of Lethbridge LUX Hotel, and Lethbridge College Summer Housing. Exhibition Park, with six buildings, Heritage Hall, West Pavilion, North Pavilion, South Pavilion, Main Pavilion and the Saddle Room hosts over 1550 rental nights per year with over 570 clients.